The Moscow railway station in St. Petersburg is located in the city center - on the Uprising Square. It is one of the five railway stations of the Northern capital and is one of three the most loaded in Russia. 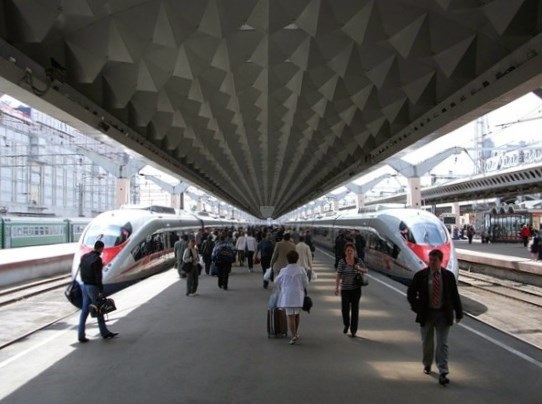 The decree on the building of the railroad between Moscow and St. Petersburg was signed by Nicholas I in 1842 and then it has decided that the buildings of the railway stations in these cities would be the same. Architect of the building is Konstantin Ton, he is the author of the project of the church of Ekaterina at the Circuit channel in St. Petersburg, the Cathedral of Christ the Savior and the Grand Kremlin Palace in Moscow. The architect, academician and professor Rudolf Zhelyazevich also took part in the working process. The Department of Railways has developed a plan of the building and in 1943 Constantine Ton began working on the project. The place for the construction was chosen in the city center that was very convenient for passengers and the building construction was organically fitted into the image of this district of St. Petersburg. 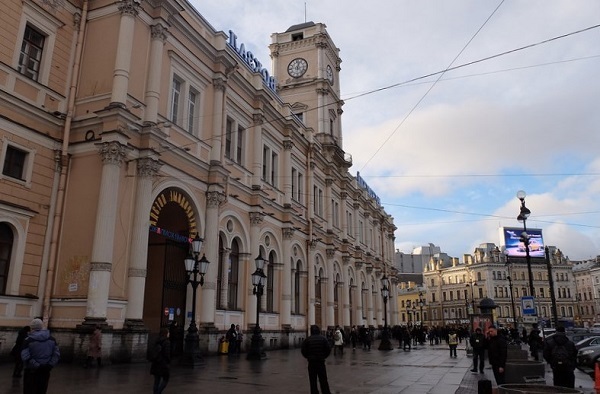 The process of building was carried out at the same time with the building of the railroad and in 1849 the railway station has been built in Moscow and in 1851 - in St. Petersburg. The two-storiedbuilding in the Renaissance-style was decorated with low round columns and the facade of the building reminded the town halls of western European cities. The windows were made in a Venetian style and in the center of the building a clock tower was erected, reminding the image of a tower - a calanchy at the onetime building of the City Duma indicating the direction of the main entrance to the building. The built railroad had two paths and was the longest in the world, it was the largest engineering facility for that time.On August 18, 1851, at 4:00 AM, its opening took place, when the emperor and his family departed from St. Petersburg as the first trip and after 19 hours the train arrived in Moscow. As Nicholas I was afraid to travel by train on rail bridges, he left the car and followed the lineup on foot. Regular transportation was opened on November 1, 1851 and the newspapers called the train folk. The railroad was popular among passengers and the station could not cope with a large passenger traffic. A reconstruction was carried out during which a two-storied outbuilding for receiving luggage was installed and the right wing of the building was connected with the royal chambers. In 1898 from the side of Ligovsky Prospekt a brick building of the department of Nikolaev railroad was attached.By this time the Znamenskaya square was completely built up and further extension of the railway station could pass only towards the railway tracks. In 1912 it was decided to build a new building of the station and in the result of the carried out competition for the best project has won the work of the most demanded at that time Petersburg’s architect, academician of architecture Vladimir Alekseevich Shchuko. The building of the left wing of a new building – the Arrival Corps - has begun. The started civil war put a crimp in the realization of further plans and the old building was not demolished. In June 1931, the Red Arrow train has set off from the station to the first trip and on December 15, 1962, the road was electrified and the Red Arrow was driven by the first electric locomotive ER-1-107. Underground transitions were made with exit to the city and to the Uprising Square metro station. 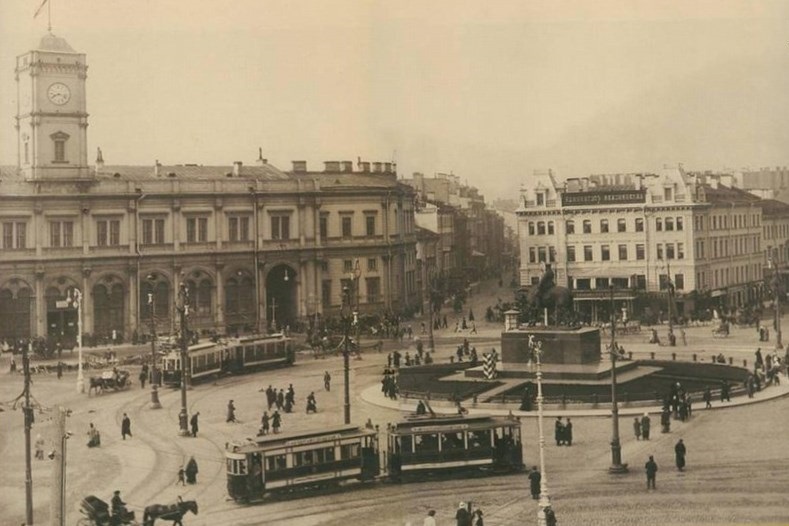 In the 50's from the side of Ligovsky Prospekt to the right wing a new outbuilding with the second vestibule of the Uprising Squaremetro station was attached. In 1967 a new light room was opened and the area of ​​the Moscow station increased to 2700 square meters. In the center of the hall were installed bust of V.I. Lenin, works by the sculptor Leonid Mass, who in 1993 was replaced by the bust of Peter the Great. During the preparation for the 300th anniversary of St. Petersburg in 2003, the Moscow railway station was restored and an automated control system for passengers on electric train was introduced.In 2005 the building has been repainted to its original sand color. The specialists of the railway transport constantly worked on reducing the time in the motion between the two capitals.So, since 1984 the electric train ER-200 was launched which in 1987 was able to enhance a speed up to 200 km per hour and the travel time was 4 hours and 20 minutes. On December 17, 2009 a train Sapsan departed for the first time from the capital at 19-00 and within 3 hours and 45 minutes it had arrived in St. Petersburg. The speed of the express can reach 250 km/h, which became possible thanks to the modernization of infrastructure, which took place from 2006 to 2009. In 1923 the railroad and the railway station were renamed and became the Oktyabrsky. Since 1930 the railway station has been called Moscow and the railroad is called October till now.